Shoe Shine Wine by Justice Grace Vineyards. Focused on CA heirloom varietal Petite Sirah. Dedicated to serving as a resource for the Living Wage movement. Over more than a decade, Shoe Shine Wine, and now Solidarity Wine, have proudly been dedicated to supporting the Living Wage movement. Despite our nation's resources, 45 - 60 million people(1) now live in poverty/ low-income working families in the U.S.
That's nearly 1 in 5. "About four in ten Californians are living in or near poverty." Tens of Millions of our neighbors are working full time in arduous jobs, doing the work that Americans require and are asking a human being to do. For that life, the workers live in poverty and suffer indignities from society. It’s very simple: large corporations who require the most low-wage employees to earn their profits, are recording record profits, storing record amounts of cash off-shore without paying taxes, while their employees live at/ near poverty and taxpayers pay the estimated $150 Billion/ year for these employees to receive social services to survive. Q: Why should taxpayers pay the costs of these social services, and not the owners receiving the profits from their labor? The living wage movement has been leading the way in restoring work-with-dignity. Grassroots campaigns have won living wage ordinances in more than 130 cities and have helped lead the discussion in winning recent city & state increases (voter initiatives) in minimum wage rates across the country, and supporting the Fight for $15 campaigns nationwide. 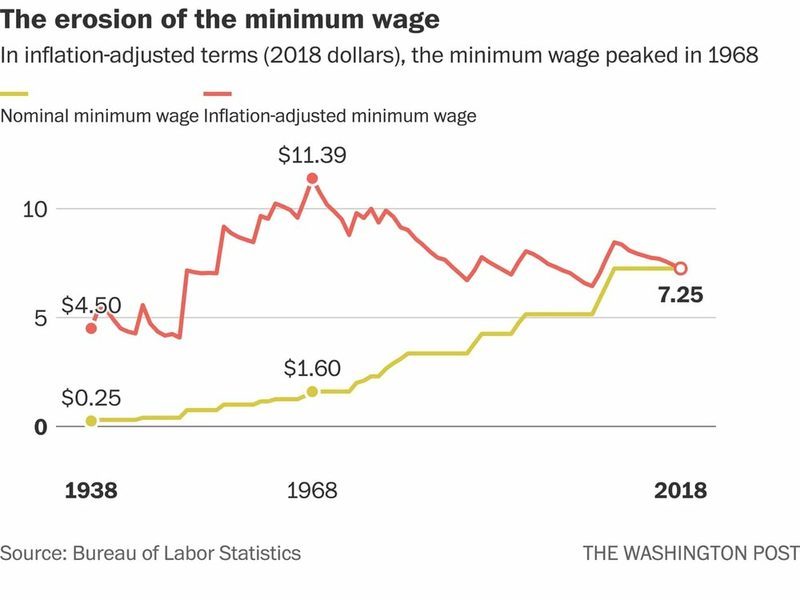 It has been nearly 10 years since the last federal minimum wage increase by Congress, and for an unfathomable 50 years, the value of the minimum wage has declined. Q: Has the amount of effort required for that work declined, at all? The decades' old "poverty wage" rates used by the government to shape public policy are deliberately kept way too low and utterly outdated, and a real-time local "Living Wage" is the only true wage to lift families out of poverty. The evidence is clear: workers earning even the proposed $10 wage rates often depend on public assistance to make ends meet, while their employers transparently cheat our country out of $ Billions in taxes (off shore loopholes) while earning record profits, often in the $ Billions for big box retailers. Big Box Corporations have "outsourced" real wages to middle-class taxpayers -- whether you are their customers, or not. We do not accept an economic or political system which perpetuates a false notion of scarcity, encourages a race to the bottom and poverty wages, and a massive transparent wealth transfer from the poorest to the super rich. We are committed to changing the values and false mythologies which enable this injustice. We hope you will Join Us and all Living Wage allies, and Yes, enjoy some beautiful wine along the way... Let's celebrate the passion and commitment of those fighting to restore dignity to working America. which estimates over $150 Billion in subsidies each year needed by working families, which we think, the immensely profitable companies should be paying directly as wages. "Sen. Bernie Sanders (I-Vt.) will soon introduce legislation that would require large employers like Amazon, Walmart and McDonald’s to fully cover the cost of food stamps, public housing, Medicaid and other federal assistance received by their employees. The goal, he says, is to force corporations to pay a living wage and curb roughly $150 billion in taxpayer dollars that currently go to funding federal assistance programs for low-wage workers each year." When workers risk everything and take a stand to protect themselves, Please support their efforts. © Justice Grace Vineyards. 2019. All Rights Reserved.